Our 3M™ Scotch-Weld™ Structural Adhesive Film AF 163-2 encompasses a family of thermosetting modified epoxy adhesives in film form that provides long-term durability and meets specific challenges for metal and composite solid panel and honeycomb sandwich construction, where high fracture toughness and peel strength is required. 3M™ Scotch-Weld™ Structural Adhesive Film AF 163-2 provides excellent performance with easy-to-use shop handling properties. 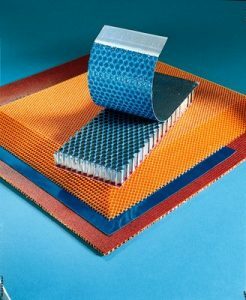 These adhesive films are available in a variety of weights and carriers to meet a range of needs without imposing excess material costs. With high fracture toughness and peel strength, AF 163-2 provides a reliable, long-term bond suitable for composites, metals in solid panel and honeycomb sandwich fabrication. We also offer an unsupported version, which can be used for reticulation. It is also compatible with multiple substrates and primers. In addition, AF 163-2 exhibits excellent pre-bond humidity performance on composite substrates. Our heat-curing, easy handling film is designed to meet numerous customer specs in aerospace manufacturing. AF 163-2 supplies high fracture toughness and peel strength through a spectrum of environmental conditions and is easy to work with. Once cured it provides high bond strength from -67°F to 250°F (-55°C to 121°C) for use in multiple designs through multiple environments. What is Structural Adhesive Film? The fewer rivets you have in your aircraft the better. Structural adhesive films enable the designer to get more innovative with their parts, and reduce the overall number of rivets required on your structure. This thermosetting modified epoxy in film form can be used for bonding a wide variety of substrates, including metal, honeycomb and composite. Structural Adhesive Films come in a variety of weights and thicknesses, minimizing the weight while maintaining the structural integrity. The films are available in supported versions, which are typically used for monolithic bonding or honeycomb sandwich. They are also available in unsupported form for reticulation onto honeycomb. These films can be cured from temperatures as low as 180°F to as high as 350°F. Because these films are less messy and don’t required mixing, they offer efficiencies in the design process. They are easier to use than typical paste adhesives. Adhesive bonding enables a more lightweight structure because it allows you to use more lightweight composite, as opposed to the metallic materials that were used in previous designs. Structural adhesive films are employed anywhere you are trying to bond metal to composite. This offers good erosion performance while minimizing weight. 3M is proud to partner with organizations across the spectrum of aerospace and related industries. Creating efficiencies, reducing process times and lowering aircraft weight is how we execute our never-ending mission to offer best-in-class adhesives, sealants and other products that effectively reduce costs on multiple fronts.